Lend Me Leave (George Knightley, Esquire; Book 2) – Barbara Cornthwaite + GIVEAWAY!!! 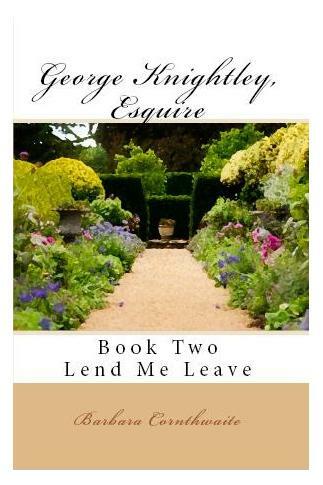 Lend Me Leave, book two in Barbara Cornthwaite’s sensational George Knightley, Esquireseries, recommences with our hero, the admirable, benevolent, and sagacious Mr. Knightley, trying to stealthily and silently woo his darling Emma. Book One, Charity Envieth Not, ends with three Donwell bachelors suffering from love-sickness: Mr. Martin, who is still nursing a broken heart after Harriet’s refusal; Mr. Spencer, Donwell’s new curate, who bungled his first proposal to the compassionate widow, Mrs. Catherwood; and Mr. Knightley, who fears that all his hopes and desires in regards to Emma Woodhouse will never be realized because of that blasted Frank Churchill! Although this series is centered upon Mr. Knightley, readers will be able to witness how all three of these lovelorn and worthy bachelors fare in this installment. What an all-encompassing, accomplished, and outstanding series! In her second book Barbara Cornthwaite dexterously and intuitively reveals all Mr. Knightley’s thoughts and feelings throughout the major plot events of Emma. Readers are able to witness his anxiety over Emma’s flirting with Frank Churchill, his absolute delight when Emma teases and smiles at him, his compulsion to rescue Harriet during the ball, and his determination to reproach Emma for her insult to Miss Bates. Mr. Knightley really is a most magnanimous and tender hero, and I utterly loved my time with him in this series!